The Michigan No-Fault Act provides for the payment of certain guaranteed benefits to all people injured in a motor vehicle accident, regardless of who was at-fault. [MCL 500.3105(2)] A bicycle is not considered a “motor vehicle” and for this reason, an injured cyclist will not be entitled to benefits, unless the injury arises from the operation or use of a motor vehicle. It is important to note that actual physical contact between a bicycle and a motor vehicle is not required, provided that the operation of the motor vehicle was a significant factor in causing an injury to the cyclist. However, if a cyclist sustains an injury as a result of a collision with another cyclist, a road defect, or simply losing control of his/her bicycle, the cyclist is not entitled to recover no-fault insurance benefits under the Michigan No-Fault Act. 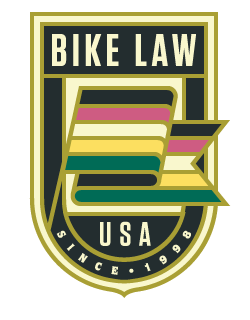 Since a large percentage of cycling injuries, and particularly the most serious injuries, are caused by motor vehicle/bicycle collisions, it is important to understand some basic concepts of the Michigan No-Fault Act. Allowable Expenses. An injured person is entitled to recover “allowable expenses” consisting of “all reasonable charges incurred for reasonably necessary products, services, and accommodations for an injured person’s care, recovery, or rehabilitation.” (MCL 500.3107(1)(a)) Additionally, these benefits are payable for life and are payable without regard to any type of “cap” or “ceiling.” These benefits include medical expenses, in-home attendant care or nursing services, handicap-accessible accommodations, room and board expenses, rehabilitation expenses, special or handicap-accessible transportation, mileage to and from healthcare appointments, and guardian expenses. Wage Loss Benefits. When a person is injured in an automobile accident and cannot work as a result of their injuries, they are entitled to receive wage loss benefits, which are calculated at a rate of eighty-five percent (85%) of the injured person’s gross pay for up to three (3) years. [MCL 500.3107(1)(b)] Additionally, under the statute, work loss benefits cannot exceed a monthly maximum, which is adjusted in October of each year to keep pace with the cost of living. Replacement Services. An injured person may receive benefits as a result of having other people perform domestic-type services that the injured person would have performed, if not for their injuries. However, reimbursement for these services cannot exceed $20.00 per day, and these benefits are only available for up to three (3) years following the accident. [MCL 500.3107(1)(c)] Typical examples of replacement services include household chores, such as cleaning, laundry, cutting grass, and shoveling snow. Survivor’s Loss Benefits. Where a motor vehicle accident results in death, dependents of the decedent are entitled to recover survivor’s loss benefits (MCL 500.3108) and funeral and burial expenses [MCL 500.3107(1)(a)]. Survivor’s loss benefits are payable for three (3) years and are comprised of several components, which include after-tax income, lost fringe benefits, and replacement service expenses. Additionally, survivor’s loss benefits are subject to the same statutory monthly maximum applicable to work loss benefits. Typically, an injured person will receive no-fault benefits from his/her own no-fault insurance company. If a cyclist does not own an automobile or have auto insurance, he/she may receive no-fault benefits from the insurer of any relative with whom he/she resides. If the injured person does not have a no-fault insurance policy, and does not live with a relative who has a no-fault insurance policy, then a cyclist will receive his/her benefits from the insurer of the “vehicle involved” in the accident. If the vehicle is uninsured, as a last resort, the injured cyclist may make a claim with the Michigan Department of State, Assigned Claims Facility. This is a government office that has been established as the last resort for auto accident victims to receive no-fault benefits. The Michigan No-Fault Law is far too complicated to be explained adequately here. For more information regarding the Michigan No-Fault Act, please feel free to contact the Sinas Dramis Law Firm and request a copy of a separate publication entitled, “The Michigan No-Fault Automobile Insurance Law: Your Rights and Benefits.” This publication can also be found at www.autonofaultlaw.com, by clicking on the “Our Free Literature” icon. In addition to a claim for no-fault benefits, an injured cyclist may also have a tort or liability claim if another person or party is at fault and/or their negligence causes the cyclist to be injured.